Get started on bubbleFiz in 3 easy steps. We’re excited to connect your team. We do our best to keep things simple over here at bubbleFiz. So, here are three simple steps get you started on bubbleFiz. First things first, let’s get the basics out of the way. Get the app installed and make sure you can login. On your device (using either Google Android or Apple iOS) download the bubbleFiz app from one of the respective App Stores. Visit our bubbleFiz Download page for quick links to the App Stores. Once the app is downloaded to your device, open the app and follow the login process (we think it’s pretty easy). If you need some more detail, view our Download and Log in guide here in our Help Centre. 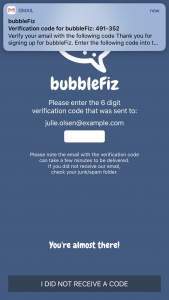 Once you have successfully logged into the bubbleFiz app, simply complete your bubbleFiz member profile. This helps your team or community know who you are, both in bubbleFiz and in the real-world when it comes time to meet up. Learn more about profiles in our Help Centre. Think of a bubbleFiz Team as mission control for your team experience in the bubbleFiz app — it’s where all the pieces come together — secure groups, team members, structured data, item templates, chat, and the @fiz virtual assistant. Bring people together in Groups to chat, engage and simply get work done — team updates, tasks, checklists, projects, surveys, polls, or figure out what’s for lunch — anything. Simply create your Team, create Groups and invite your teammates. Get all the info you need from our Help Centre. You should now be up and running on bubbleFiz! It’s that simple. Remember, if you need more help, head over to our Help Centre and get in contact with our support team.